The Kingsley Stags defeated the Glen Lake Lakers 61-45 at home on Friday night. 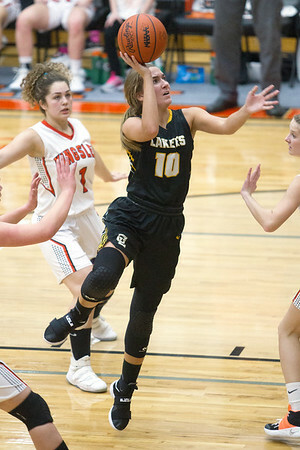 Glen Lake's Jennifer LaCross (10) is surrounded by Kingsley defenders as she goes up to the basket during the second quarter of the game at Kingsley High School on Friday night. The Stags beat the Lakers 61-45.